Age is finally beginning to catch up with Tom Cruise. He’s started looking like he’s in his mid-thirties. That’s somewhat annoying when you consider that the Mission Impossible action movie franchise is now 22 years and six movies old, and the action and the stunts only get more and more intense with each new film. There aren’t that many action movie franchises out there that have the same lead actor, pulling ever more crazy stunts, especially in this age of CGI and digital actors. But you know something? It’s the reality of what you see on screen that makes all the difference. Mission Impossible 2 put me off the whole franchise back in the day, and it was only a bargain budget boxset last year that showed me what I had been missing. John Woo’s entry was just a blip. So you can bet that Mission Impossible: Fallout was a week one purchase for me. While Ethan Hunt had captured Solomon Lane in Rogue Nation, you don’t shut down an operation like the Syndicate overnight. A group called the Apostles are still at large, still acting as terrorists for hire, and still intent on the end of the world order. To that end, they’ve set their eyes on three stolen Russian plutonium cores. Ethan Hunt chose to accept the mission to retrieve the cores, but the mission failed when he was forced to choose between the life of one his team, and the lives of millions. Now he has one more chance to get the plutonium back, but this time he has a CIA watchdog assigned to his team, an agent named August Walker. The film gets a 2:39:1 widescreen 1080p transfer, opening up to almost full screen for the IMAX sequences. Either I’ve become so used to the process, or the film is so engrossing, that I just didn’t notice the aspect ratio shift at all, and only realised the scenes were IMAX when I saw the extra features. You have the choice between Dolby Atmos English (with a True HD 7.1 core), and Dolby Digital 5.1 Surround French, Spanish, Portuguese and English audio descriptive, with subtitles in these languages. The image quality is as pixel perfect as you’d expect, with the only niggle to note a slight flicker in some of the IMAX shots. The audio too fully immerses you in a brilliantly sound designed action movie. If you want better than this, then your only choice is to go 4k UHD. You get two discs in a BD Amaray case, one on a central hinged panel, and with the sleeve art replicated on an o-card slipcover. The discs boot to animated menus. Disc 1 is devoted to the film, so all you’ll find here are the commentaries and isolated score. The latter is presented in DD 5.1 Surround and does what it says on the tin, and to complement it, one of the commentaries is from composer Lorne Balfe. 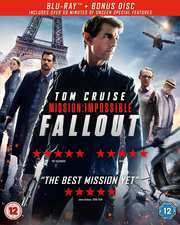 The other commentaries feature director Christopher McQuarrie with Tom Cruise, and then Christopher McQuarrie again with editor Eddie Hamilton. The video extras are on disc 2. Here you will find seven featurettes in Behind the Fallout running to 53:32 and looking at the making of the film. The 3:41 Deleted Scenes Montage with optional commentary from director and editor is a bit of a disappointment, and there is no dialogue to any of the scenes, just the music score. Foot Chase Musical Breakdown sees Lorne Balfe return to see how the music was put together for that one sequence. This lasts 4:50. The Ultimate Mission lasts 2:51, and feels like a trailer for the making of featurette. The Theatrical Trailer on the other hand has more in the way of deleted scenes than the montage, and it runs to 2:33. Finally there are Storyboards for four scenes. I recall how this film was hyped as Mission Impossible meets the Man of Steel, when the casting of Henry Cavill was announced. It also led to the infamous moustachegate affair when Justice League reshoots coincided with the making of this film. It would be more genre appropriate though to describe this as Mission Impossible meets The Man From U.N.C.L.E. as Henry Cavill played Napoleon Solo in that film. As for the film; I’m stunned to find a franchise that just gets better and better with each new film (Mission Impossible 2 being an outlier). Mission Impossible: Fallout is the best entry yet. Following the amazing Burj Khalifa sequence in the fourth film, I thought that couldn’t be topped, but somehow the films keep on doing it. There are several edge of the seat sequences in Fallout that are simply breathtaking, not least a stunning sky-diving sequence, and of course there aren’t many movies where the sight of a lead actor breaking an ankle is caught on film. 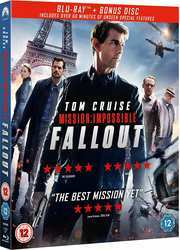 I said it in the review for the boxset, and I’ll say it again, Tom Cruise has become Hollywood’s answer to Jackie Chan. And just like those classic Golden Harvest Pictures, the Mission Impossible movies are made on the fly, stunt sequences having story built around them. Unlike some of those Golden Harvest films, the narrative in Fallout is strong and consistent, making for a great action adventure tale. And on top of all this, the film keeps the emotional journey of the characters at the centre. You care more about the world in peril, and nuclear weapons falling into the wrong hands, when you care about the characters on screen. A key philosophy at the heart of the film is that one life is just as important as a million, and that is the secret of great storytelling too. The plot is full of the classic Mission Impossible elements, the twists and turns, the betrayals and counter-betrayals, the plans within plans, the misdirections and tricks, and it’s all tremendous fun. You also get plenty of nods to the previous films in the series, as well as a few other spy flicks. The aforementioned Man From U.N.C.L.E. movie gets a reference with a similar stunt sequence used here, while a motorbike chase through a European city with this much energy was last seen in Knight and Day. If I do have a nit to pick with the film, it’s that the villain of the piece is practically telegraphed from their first frame, and it might have been more of a twist to find out that they weren’t in fact the villain, and it was someone else instead. But from their introduction, the final confrontation was inevitable, at least for me. 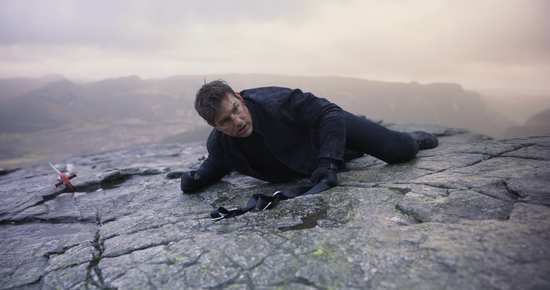 The best Mission Impossible movie yet manages to create a stunning synthesis of all its elements, action, story, character, humour, suspense, music and visuals. On this Blu-ray, Mission Impossible: Fallout looks and sounds fantastic, and it’s well worth a place in any collection. Apparently Mission Impossible 7 is in the pipeline. I would have thought that there would be no way to top this film, but judging by the last four films’ trend of increasing returns, I am really looking forward to where they will go next.